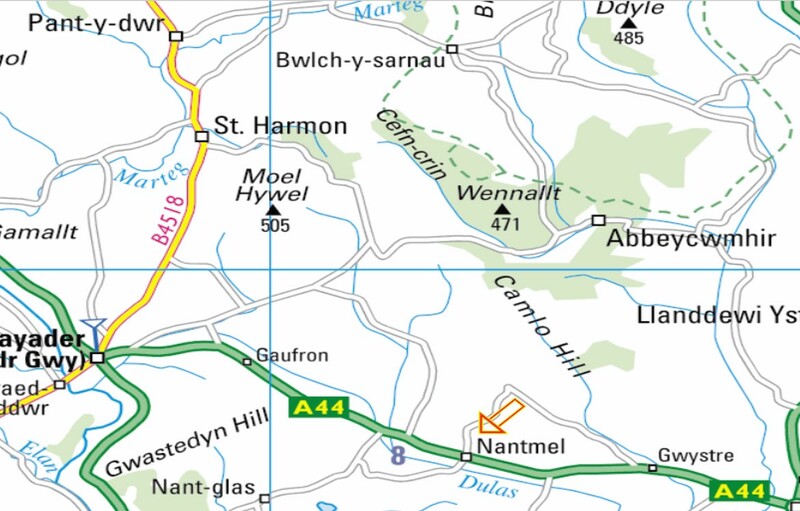 From Crossgates on the A44, just beyond Nantmel, turn right at the T junction and right again following the signposts towards Abbeycwmhir. 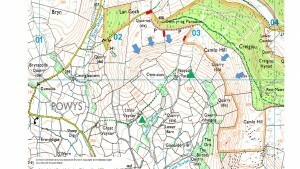 At the top of the hill by the forestry, turn right through a gate. Park in this field or drive along the track through the next gate and park on the track. Note that these fields belong to different farmers so it absolutely essential to shut the gates immediately. There is a further gate that you can walk through to access the rest of the hill, but do not drive through. Top landing can be tricky if the wind is off to the right because of rotor from the spur. Bottom landing is tight and for experienced HG pilots only. Camlo is a little flown hill, especially for hang gliders, as there is not a suitable bottom landing field. The site is very wind affected and even in reasonably wind speeds it is often blown out. It is unusual to meet fellow pilots there, as Clatter is usually a more popular site in a SW. The area at the back of the bowl between the two take offs is shallow and not recommended. Steve Nash, 27.06.2010, 61.6km to Bayston Hill. PG. 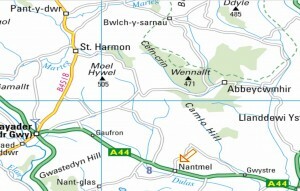 Please be aware that a Falconry centre is situated at the bottom of the hill. The owner, Mr Eddie Churchill has asked that pilots call him on 07463892639 to let him know they are planning to fly from the hill and he will not release his falcons. A25 is 3m east, base FL65 (min altitude 5500ft amsl). W39 is overhead at FL165. I fully agree with the comments made by Jason. For Paragliders, there are a few additional comments to make. The main part of the hill is not particularly steep or high top to bottom, so in light winds you don’t have much time to soar to get into a thermal. Slope landing is easy in most parts apart from a lot of bracken. If windy, then being blown over the back would not be a nice experience, as over the back is either thick forest, deep valley or a spine back ridge. If the farm track across from the road is wet and muddy then driving normal 2WD cars with low ground clearance may be impossible. Parking on the road is extremely limited, though it may be possible to park on the forest track behind the hill and walk round. As far as I am aware we do not have specific permission to launch or land on the west face of the bowl which is actually steeper and higher than the WSW part of the bowl, however once flying over to it in a westerly wind it is more likely to work very well. Advice from Hang Gliders flying the south facing part of the bowl is that it can be very turbulent due to the effects of the other end of the bowl getting in the way of the wind. Some comments from Nick Collins ref HG’s and flying it at 2014 BOS. 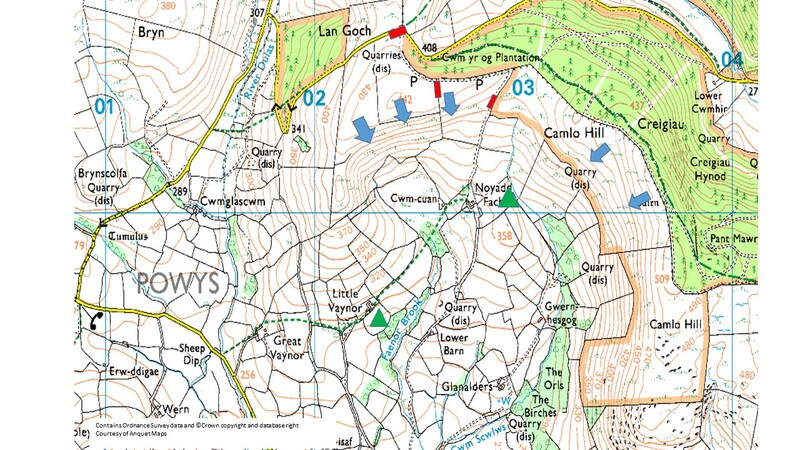 I think Camlo is a great hill, it takes anything from south to West, has a road to the top in a southerly the top has a back slope so is ideally sheltered for rigging and it has a really smooth top landing with a slight back slope. Take off is clean and smooth. It all covered iin grass. I haven’t ever been to the west face , but actually its the best bit of the hill. And in a westerly its must be 180 miles or so to the coast if not more!! Its also a really beautiful place. Bottom landing is a bit iffy but there are several options and in a light wind not a problem because further out there is a big field. Its so forgiving on direction.